This is it, the most expensive rug ever sold at auction,The Clark Sickle-Leaf Carpet, a Kerman Vase Carpet (discussion on vase carpets in later post). I assume they limit it to the most expensive sold at auction because there is no way of knowing how much wealthy private collectors might have paid between themselves for other carpets. The Carpet is thought to be a Kerman and is also of the “vase” style of Persian carpet. More about Persian Rugs than you can imagine at the Amazon Kindle Store! Sold at auction by Sotheby’s on June 5th, 2013. Here it is Described by the Architectural Digest as, The most expensive carpet ever sold at auction is this sickle-leaf vine scroll and palmette “vase” carpet, circa 1600 to 1650. After being displayed as an example of outstanding Persian carpet weaving in museums and galleries—including the Corcoran Gallery of Art, the Textile Museum, the Asia House Gallery, and Fogg Art Museum—the carpet was estimated at $5 million to $7 million. 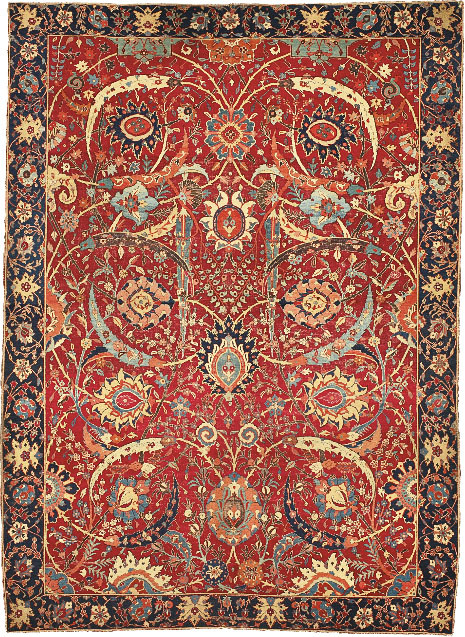 Because the sickle-leaf design is the rarest of vase-technique carpet patterns and this is the only known example featuring a red background, Sotheby’s New York was able to sell the lot for $33.7 million on June 5, 2013. I wonder about the sale price quoted here, $33.7 Million. On a video provided online by the nazmiyal antique rugs website I clearly heard the auction caller say that the carpet had been sold to a telephone caller for the nice round sum of $30 Million; yet everywhere on the web the number is given as between $33 and $34 million–except for one site that gave the even wilder amount of $43 million. Does that $33.7 include taxes, or as I suspect from the phrase in the architectural Digest piece above, “Sotheby’s New York was able to sell the lot for $33.7 million…”that the “lot” consisted of more than one rug or something?